Experiential product discovery with daily prizes. Unless you know exactly what you want, shopping for products online can be overwhelming. Too many options to sort through, changing prices, and countless reviews to read. Millions of people love physical shopping for the thrill of discovering new products with friends. However in the online world, there are few ways to truly have fun while discovering new products. Top of the funnel online product discovery typically starts with content marketing, digital advertising, recommendation engines on e-commerce sites, YouTube videos, independent review and media sites, or social media recommendations. ProductBattle is an iOS app that turns Amazon product metadata (available via API) into the “Price is Right” and similar-style games. Users have fun competing with other users to correctly answer product related questions in the hope of winning a prize. 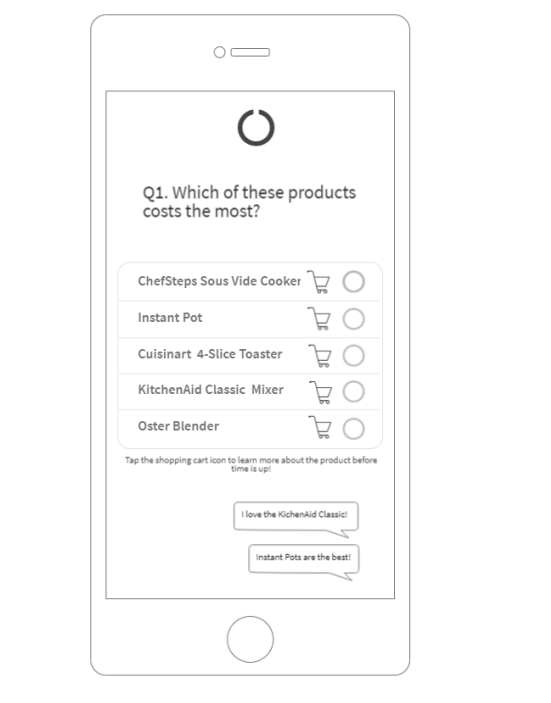 While answering questions, users are presented with interesting facts regarding the products and have the option to purchase the product directly on Amazon or save for later. The app will generate money by driving traffic to Amazon and receiving affiliate fees for any conversions that happen from this traffic. Additionally, product sellers can pay to have their products featured in the apps contests and games.